Growing up, my ambitions were tied to sense of place, first as a cowboy on our ancestral ranch in the Yellowstone nook of Idaho, then in grade school as either a uniformed Forest Ranger or a Fish and Wildlife Officer. I have always loved wildlife, so running up Ashton-Flag Ranch Road and veering off into the remote Idaho corner of Yellowstone Park was always a spectacular option. In the early 1900s, my paternal grandfather, Mel Bowman, then 22 years old, helped pioneer the 40-mile route that slices between Yellowstone and the north end of the Tetons. During the dead of winter between 1910 and 1911, while my grandparent’s ranch lay buried in snow drifts, my grandfather and his brother ran wagon loads of cement along the dirt and gravel road using teams of four draught horses each. Each trip took four days over and two days back in below freezing weather. In return they received $80 each not including provisions, horse feed or overnight stays in tepees along the way. The objective was construction of a concrete dam in order to raise Jackson Lake by thirty feet for the purposes of supplying irrigation water, and eventually along with six other dams along both sides of the Tetons, a source of hydroelectric power. 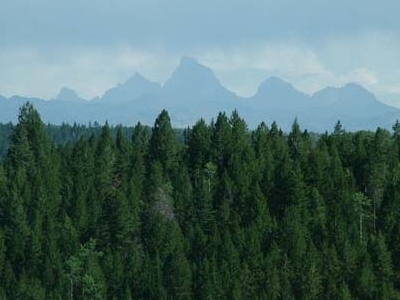 A view down the Tetons from a ridgeline at the beginning of the road is one of my favorite views of the 40-mile Teton Range. But this was only one option for viewing wildlife during my early years. Two other favorite trips including going a mile or two across the Henry’s Fork to the hatchery to see native Cutthroat trout fingerlings and riding horseback into the Sand Creek Elk Refuge that ran down the west side of the ranch including Moose in the wetlands down near Chester. Less than fifty miles due west of the ranch, the 10,000-acre historic Camas National Wildlife Refuge (shown in this image) is one of nearly 600 nationwide. Filled each spring and fall with tens of thousands of migratory waterfowl including Trumpeter Swans, the Camas NWR is now at risk. Center-pivot irrigation technology (the circular farm land you see from an airplane) not only pushed farming out that way in the 1960s and 1970s but it soon began to deplete ground water that kept the refuge’s wetlands wet. So ironically, the refuge has had to also pump water from the aquifer in order to sustain places for the big birds to stop for rest flying south and returning north. Probably gone are the days when we could see more than 50,000 ducks and geese in flight all at the same time. Now the Refuge must be selective about what habitat it can keep viable. Thinking I might want to be a lawyer, I didn’t turn back to my love of sense of place until part way through law school in Spokane, Washington. In the 1970s, when I was helping to start the community-destination marketing organization there, we included the huge Turnbull National Wildlife Refuge which was 25 miles southwest in our inventory of nearby things to see and do. Spectacular flights of huge Trumpeter Swans is what I remember there. The largest of North American native waterfowl, Trumpeters (for the sound they make) stand about four feet tall but stretched out in flight they measure 6 feet from bill to feet and another 6 to 8 feet in wingspan. They had become almost extinct before I turned six years old in the 1950s. When I was recruited to Anchorage to complete another start up, I lived on a steep bluff along the southern edge of the city between Kincaid Park and Discovery Bay overlooking Turnagain Arm, with a spectacular view down Cook Inlet. The glass wall and front door of my ground floor condo was less than a dozen steps from the bluff’s mid-point along the 33,000-acre Anchorage Coastal Wildlife Refuge that runs along the south side of the municipality from the airport to Potter Marsh, a wildlife area created in 1917 when construction of the Alaska Railroad isolated a wetland. Our organization lobbied successfully for the bird refuge at Potter Marsh to be interpreted for visitors along a 1,500 foot boardwalk, now one of Alaska’s most popular wildlife viewing areas. Potter Marsh isn’t just for the birds, including an occasional Trumpeter. When I lived there in the 1980s, more than 1,100 Moose in Anchorage used the mountain to sea greenways as their highways. In the spring, the Marsh is where they calved just a few miles from where I lived and worked. Just around a corner, while still in the municipality of Anchorage you can see Dall sheep (which look similar to mountain goats) climbing a rocky slope just above the roadway, and a bit further, a lookout to see Beluga whales. There are ten wildlife refuges in North Carolina including Roanoke River which was created the year I moved here, but most are a good ride east from Durham where I finished my career after building yet another community start up with natural place based assets included. A friend and I may visit one refuge in particular the next time we take the Harley Crossbones to visit friends in Charlotte. As we cut down across the “heart” of North Carolina and under Uwharrie National Forest this time, the Pee Dee National Wildlife Refuge is on our way just outside Wadesboro. We forget how much tourism overall relies on infrastructure, including green infrastructure such as the National Wildlife Refuges. They weren’t created for the sake of tourism, but like much of the nation’s green infrastructure, that is a huge economic byproduct. Even in cities, natural assets are among the most productive of place-based assets essential to both quality of life and quality of place.